Since there will be no new studies conducted, we will use existing values referenced above in 2.10.5-1. For this case study, the data shown in table 2.10.5-2 is used to estimate the baseline population for each health condition. Several methods are used to estimate the change in ambient concentration as a result of the change in emissions from the retrofit program. The results are then compared. Rollback: Because there is no available air quality modeling for this city or carrying capacity estimate, the k coefficient cannot be calculated directly. So, the typical k range of 4000-60000 that was given in the discussion is applied. For the region that is 16415 km2 in size, a change in emissions of -0.32 t/d will result in a concentration change of between -0 .08 and -0.12 ug/m3 using the ambient rollback equation listed below, which was derived in the previous section. A mid-range change is -0.1 ug/m3. We assume the average wind speed is 1 m/s meaning the inversion layer breaks, or roughly the wind creates an air exchange every day and a half. Then the emissions change is calculated for one day over the region and applied to equation 2.10.5-5. The ambient concentration change for the mid-range height is around 0.035 ug/m3 using this box model analysis for this example, as compared with 0.1 using the same parameters in the rollback model approach. Where Δ A is in ug/m3 and ΔQ is in g/s, BR is in m3/s. A comparison of the mid range of the estimates is shown in table 2.10.5-9. 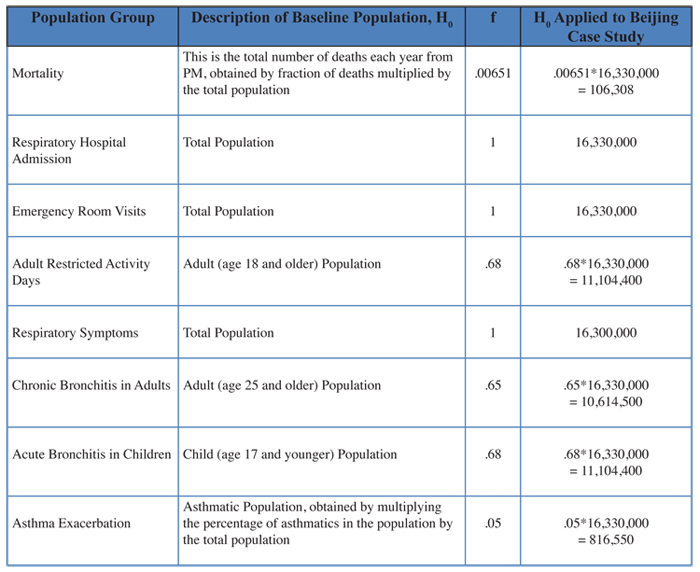 All of these data are used to estimate a range of health effects in Step 4. The mid-range DR coefficients were used for all calculations in this table. The mid-range concentration estimate indicates about 22 deaths would be avoided and about 300 emergency room visits with the reduction from the Beijing retrofit case study of .32 tons/day decrease in PM10. Thus, this simplified health impact analysis indicates that there was considerable health benefits to making the retrofits to lower emissions from certain diesel vehicles in Beijing.